We all know about Botox. What about other procedures? Is there any other way of turning back the clock? Science and technology have been in service of beauty for centuries offering procedures for fighting wrinkles. The latest developments include new wrinkle fillers, fractional CO2 laser skin resurfacing, rhinoplasty as an anti-aging procedure, benefits of antioxidants and the Titan, another non-surgical alternative. There have been major new developments in wrinkle injection technology. A growing number of fillers has evolved in order to target all possible places on face. Among the latest wrinkle fillers, Restylane Silk fills wrinkles around lips. Restylane Silk consists of smaller particles in order to achieve the better look. Additionally, this filler has numbing agents which prevent pain. Perlane is another derma filler which has larger particles than this of Restylane Silk. Consequently, it can fill severe facial wrinkles such as nasolabial folds. The latest advances in this field are designed not only to fill wrinkles but also to create more youthful appearance by adding volume to the face. Wrinkles are not the only signs of aging, volume loss is important, as well. With age, the face loses its roundness and plumpness. The latest filler for volume restoration is calcium hydroxylapatite. This filler promotes collagen production and it is thicker which means that less products is used. Considered as a breakthrough in the anti-aging technology, fractional CO2 laser skin resurfacing produces fantastic results which can last from eight to ten years. This treatment is maybe pricy but it is the best and most effective one if you want visible results after only one treatment. The laser removes columns of soft tissue, but the skin which surrounds the columns is not treated. In this way, the intact skin helps the healing process. Laser resurfacing promotes natural collagen production in body. 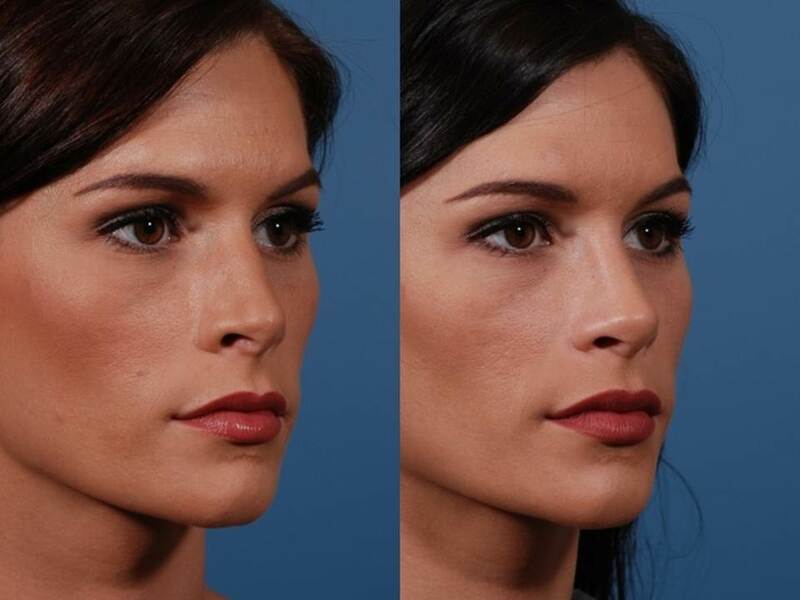 The traditional CO2 laser did the same thing, but the fractional laser skin resurfacing offers the minimal downtime and does not damage the top layer of the skin. The downtime can last from seven to fourteen days. However, it is a small price to pay for the maximum results. The only negative point of the treatment are medications which must be used both before and after the treatment. The anaesthesia is recommended, as well. Improving the balance of face and repairing injury or deformity are not the only benefits of rhinoplasty. When we age, the skin is shrinking and as we have mentioned, the volume of the face is lost which leads to the nose appearing larger. Furthermore, the skin thickens with age which together with weakening of ligaments which hold the tip of the nose leads to dropping of the tip. The cartilage the nose consists of loses volume resulting in a bulge on the nose making it appear larger. According to the new study, patients who had rhinoplasty appeared 1.5 years younger than those who did not undergo the treatment. Another discovery was that people without the bulge on the nose regardless of the age looked younger according to observers. To sum up, rhinoplasty is the new anti-aging treatment. As for any procedure, research to find the best clinic and professional stuff. Apart from food rich in antioxidants, the technology brought new products which contain antioxidants and which are applied on the skin. The main function of antioxidants is to destroy free radicals which damage collagen production. Additionally, the research proved that the sunscreen is more effective if it contains antioxidants. The most effective antioxidants include vitamin E, vitamin C, Resveratrol, Retinol and green tea. However, some experts believe that coffee berry is the best antioxidant on the market. This non-surgical procedure is a great alternative for those who do not want to go under the knife. This treatment uses the infrared light source stimulating the collagen production. The heating of skin layers causes collagen rebuilding while cooling during the procedure protects the skin. The main advantage of this procedure is that almost all areas can be treated: from the face and neck to abdomen, thighs and arms. The results cannot be seen immediately as it takes up to six months for new collagen to form. Another benefit is that the downtime is minimal. The topical anaesthesia may be applied. With this tempo, imagine what science and technology can bring us in the future! Clear, healthy, youthful and smooth skin is not an ideal we cannot achieve anymore. It has become reality.